This Carrara Marble Fireplace Style is pictured here carved from Italian Arabescato. Italian Arabescato is a stone that comes from Italy. Contemporary Carrara Marble Fireplace is a modern design that is part of our Black Label Collection. The Black Label Collection is a curated assortment of fireplaces that were exclusively designed and use exceptionally high quality stone. A great frame surround design that Artisan Kraft offers in several different colors and materials. Our Sale Page items are our stock items more or less and those sell quickly make sure to purchase yours. We offer installation on out mantels please call us or visit our fireplace installation page. Pictured in Italian Arabescato marble in a polished finish. 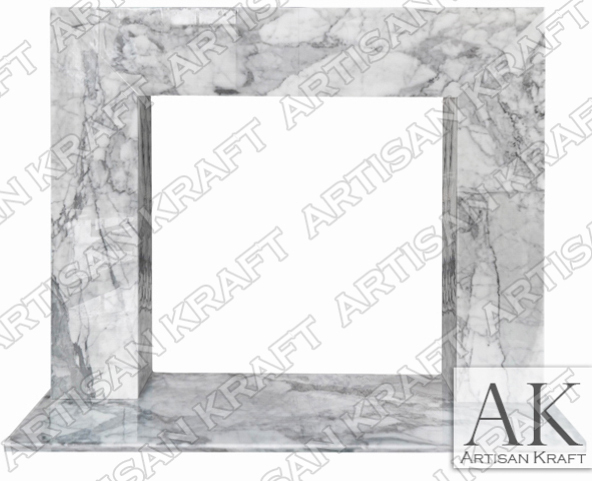 Available in Italian Carrara marble.